3 cups shredded sharp Cheddar cheese, 12 oz. 1. Preheat oven to 350 F. Next coat baking dish with cooking spray. Set aside for later use. Remove ground beef from the package. Place ground beef in a skillet over medium-high heat. Cook until browned, and drain any fat. Put aside for later use. In a separate large skillet, heat oil over medium heat. 2. Now chop peppers, onion, jalapeno, garlic, and tomato. Add peppers, onion, jalapeno, and garlic; sauté occasionally stirring, until softened 5-7 minutes. Stir in cumin, garlic powder, and chili powder. Stir in evaporated milk, tomatoes and broth; increase heat to medium-high and bring to a boil. Reduce heat; simmer until slightly thickened, 5-7 minutes. 3. Remove from heat; stir in beef. Arrange half of the tortillas in baking dish, overlapping as necessary. Top with half of the beef mixture, then half of the cheese. Repeat layers, ending with cheese. Cover with foil. Bake 30 minutes. 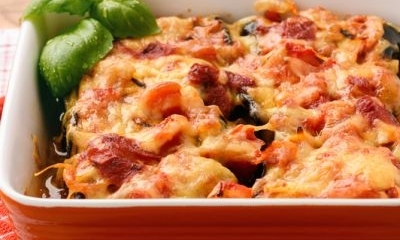 Uncover; bake until bubbling and cheese are melted, about five minutes. Makes eight servings.